I remember the game was advertised with a varied group of exotic, rich and famous types (including I believe a guy wearing a white suit and a fez if memory serves) sat playing the game, with the eventual winner declaring “Yahtzee! I win”, much to the disgust of the others. 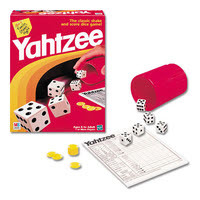 Yahtzee first appeared in 1956 published by the E.S. Lowe Company, until 1973 when Milton Bradley bought E.S. Lowe. Milton Bradley went on to create several different variations of the game, including a travel version where the dice are encased in a plastic shell so they don’t get lost, and Word Yahtzee, where the dice have letters on instead of numbers and, unsurprisingly, you have to make words in order to score points. This entry is filed under Toys - Boardgames	and was posted on May 27th, 2011. You can follow any responses to this entry through the RSS 2.0 feed. You can leave a response, or trackback from your own site.